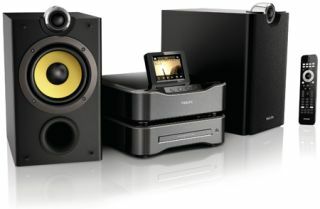 Spotify comes to Philips Streamium wireless hi-fi range | What Hi-Fi? Spotify is now available on Philips's MCi8080 (above) and MCi900 Streamium wireless hi-fi systems, although owners will have to subscribe to Spotify Premium to get the service. To upgrade the Streamium systems, all you have to do is switch them on and the update will begin automatically. Once it's completed, and provided you have a Premium subscription, you'll be able to access Spotify's huge music catalogue on demand. Owners who also have a smartphone or tablet will be able to browse and manage Spotify via the free Philips MyRemote app, which is available on the Apple App Store and Android Market. And for those who have more than one Philips Streamium multiroom device, the app allows you to switch between them and control each one independently.